Our vision is to be our clients’ most trusted advisor; helping them to realise their aspirations whilst being a great place to work. We aim to add value by taking a close look at all aspects of our clients’ working life. The mark of a good relationship is mutual respect and the willingness to be on hand when needed. Wright Vigar has a team of qualified and experienced professionals. Attending events is an excellent way of learning, sharing ideas and getting to meet interesting people. At Wright Vigar we deliver informative and practical business seminars and we attend and support some great networking events. We are delighted to share with you our Tax App. Our App has been developed to provide you with useful tax information at your fingertips. Please click on the link below to gain access to our tax tables, tips, news and calculators. The seminar was expertly presented and co-ordinated. A masterclass in practical, no nonsense business tips delivered with passion and purpose. A must attend event for the SME. I found the Recipe for Growth session very helpful with lots of ideas to take into my daily work routine. The mix of knowledge levels was great and I think everyone could take away a few ‘nuggets’. The event was well run and I would love to attend any future sessions! I wanted to thank you for your time today. I think I may be one of the few people to come back from a meeting with an accountant to say that I’d really enjoyed myself! And found it very useful too. You’re brilliant! I always turn to Wright Vigar for sound advice on commercial/financial issues either in my own business or those of my clients be they start-ups or long-established organisations. 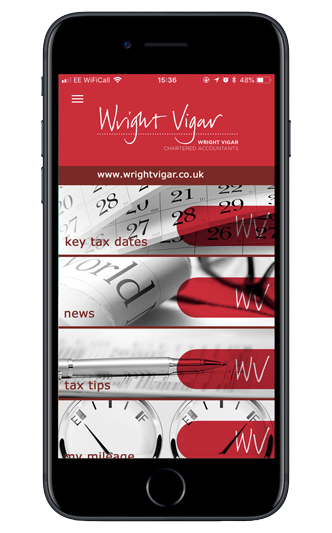 Having been established since 1979 we have had several accountants and I can honestly say that the team at Wright Vigar are by far the best we have had. I actually look forward to meetings with my accountant and I’ve never felt like that before! They offer sound advice in every accounting aspect and are good value for money. I wouldn’t hesitate to recommend them for any personal or business accounting. Of all the professional companies we dealt with, Wright Vigar were the best and most valuable. As this was my first experience purchasing my own business, Wright Vigar gave me personally a great deal of confidence. We would strongly recommend Wright Vigar to anyone. As a relatively new business we have found Wright Vigar to be invaluable with regard to advice and support. The staff have been reliable and totally competent and always obliging to our needs. We would not hesitate to recommend Wright Vigar as they offer a thoroughly professional service. I would like to take this opportunity to thank all at Wright Vigar for the professional way they carry out the accounting for Eastern Industrial Doors Services Ltd, the help and support they provide has been incredible. Our company moved to Wright Vigar in February 2011, recommended to us by another company. In the short space of time we have been with Wright Vigar the help and support received has been second to none. We would have no hesitation in recommending Wright Vigar to anyone, no matter how large or small the operation is. My wife and I attended Wright Vigar’s seminar yesterday that was conveniently timed to take place before our working day kicked-off. The presentations were a very helpful update and highlighted to us some areas requiring further attention in our portfolio of properties. Thank you very much for a very useful 60 minutes. Thinking of joining Wright Vigar? If you would like to start or further your career with a forward thinking firm, and have a passion to drive business success through knowledge, teamwork and excellence in customer service please click on the current vacancies tab for our latest opportunities – there’s no time like the present to make the change for better. At Wright Vigar we constantly strive to achieve the best in whatever we undertake – and recruitment is no exception. At Wright Vigar we have a long history of attracting and developing talented team members. Read all about our latest recruits!